The Great Pacific Garbage Patch is a crisis that, for the most part, people tend to overlook. Last year, a tsunami hit Japan, causing massive amounts of debris and drawing attention back to the oceanic landfill. So what is the Great Pacific Garbage patch, exactly? It’s actually two large patches, one of which floats in the Pacific Ocean between Hawaii and California. The other patch floats between Hawaii and Japan. Each patch is estimated to be at least twice the size of Texas. The garbage patches present numerous hazards to marine life, fishing and tourism. Plastic constitutes 90 percent of all trash floating in the world’s oceans. The United Nations Environment Program estimated in 2006 that every square mile of ocean hosts 46,000 pieces of floating plastic. Of the more than 200 billion pounds of plastic the world produces each year, about 10 percent ends up in the ocean. Seventy percent of that eventually sinks, damaging life on the ocean floor. The bits of plastic slowly break down into smaller pieces but do not completely disappear. The rest floats. A lot of it ends up in gyres and the massive garbage patches that form there and some plastic eventually washes up on distant shores. 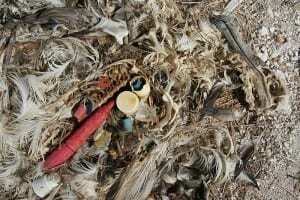 These smaller pieces, mostly plastic, increasingly show up in marine life: the very sea creatures that humans consume. These creatures are consuming the garbage that we have allowed to be deposited into those massive garbage patches in the ocean. Previous ArticleBranson, MO torn apart by tornadoNext ArticleSnooki: mom-to-be?